The Greece debt talks are at a critical point. The cash-strapped Mediterranean country must repay 1.616 billion euros ($1.8 billion) by June 30 or face default. That would likely lead to Greece exiting the 19-nation Eurozone. Worries have already caused a run on Greek banks. Withdrawals reached more than 1.5 billion euros ($1.68 billion) on June 19. Months of talks between Greece and international lenders have ended without an agreement. Eurozone finance ministers called off negotiations Wednesday evening after about an hour. Greek Finance Minister Yanis Varoufakis warned the gap between Greece and European Union and International Monetary Fund officials has widened. New taxes on businesses and the wealthy. Selective increases in the value-added tax (VAT). A value-added tax is a consumption taxadded to a product's sales price. It represents a tax on the "value added" to the product throughout its production process. Savings in pensions linked to curbing early retirement and increasing pension contributions. No further reductions in pensions or public-sector wages – "red lines" for Greece's left-wing Syriza government. Talks concluded Thursday with little done. Eurozone finance ministers simply gave Greece and its creditors more time to agree on conditions for additional aid. The weekend is expected to be heated with negotiations as the clock ticks. That's the $1.8 billion question on the markets' minds right now. It's no longer a question of "if," but when. But what exactly happens after a default? Who is really affected, and how does it unfold? 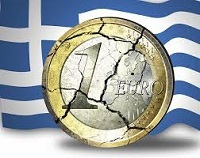 Money Morning Resource Specialist Peter Krauth says if Greece does leave the Eurozone and eventually lands on its feet, other struggling countries could follow. That's why improving consumer confidence and market strength in Europe remain top priorities. The ECB's mega-QE program will continue to support high-quality corporate debt. Uncertainty over the Greek debt talks' outcome and what it could mean for Greece and the rest of the world has weighed on stocks for months. After a solid open, the Dow ended Thursday down 76.71 points as Greece's bailout talks ended without an agreement. This means it's time to buy – if you know where to look. "The last time we saw this crisis-driven setup, savvy investors who followed along had the opportunity to take home returns of at least 245% by jumping a stock that would thrive under the circumstances," Money Morning Chief Investment Strategist Keith Fitz-Gerald writes. Here are three tactics that will let you profit from the Grexit opportunity. "To protect your financial health, ensure you have sufficient exposure to hard assets like gold, silver, and real estate like rental property and/or raw land," Money Morning Resource Specialist Peter Krauth writes. "But don't ignore cash, and consider that some currencies may benefit strongly in a 'Grexit' scenario." Thanks to these six ETFs, you can easily gain exposure to these currencies. A gold mine is something governments wish for in a national debt crisis – so why is the broke Greek government getting rid of one?